Attendees at the Greet Our Grads event, including Jerry and Connie Kerber (left and second from left) and Illinois State senior Jara Pinkham (back right). It didn’t take long for Illinois State University senior Jara Pinkham to spark a connection with Jerry and Connie Kerber. They were paired up at a recent event bringing together Illinois State’s most generous donors, including the Kerbers, with graduating students like Pinkham. Connie Kerber worked in special education for 25 years in the Normal-based Unit 5 school district, where Pinkham just accepted a special education teacher position. Donor and student became mentor and mentee—all of them Redbirds. 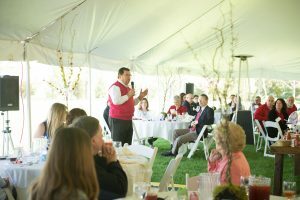 President Larry Dietz speaks to donors and students at Greet Our Grads on Saturday, April 23, 2016. Those connections were made throughout the event, called Greet Our Grads, held Saturday, April 23, outside the University Residence. Thirty students networked with more than 50 donors from Illinois State’s 1857 Society, which recognizes those who’ve made lifetime gifts of more than $50,000 to the University. Its name is a nod to the University’s founding in 1857. The 1857 Society is comprised of visionary donors who give to a variety of campus areas and initiatives that reflect their personal passions, with one constant—they all invest in the lives of ISU’s students. Pinkham said it was an honor to represent the Department of Special Education at the event. Her conversation with the Kerbers also veered into mentorship, with the Kerbers stressing the importance of networking and how beneficial it is to be an excellent communicator. Related Gallery: Greet Our Grads photos See more photos on Flickr from this inaugural 1857 Society event. Jerry Kerber was also impressed by the first-time event, which preceded the Redbird football spring game. Yes, Illinois State’s 1857 Society donors give money to the University, but that’s not all, he said. The newest group of 1857 Society donors will be inducted at October’s A Tasty Tour event. Learn more about how private giving impacts Illinois State University.